Automotive design has always been a very challenging process. A car should look good from all angles to sell well (except from the bottom, that is). It should contain the brand’s identity, coupled with the need to keep up with the latest design trends, and capturing people’s attention at the same time. It’s not a rare occasion for car designers to come up with some of the most awkward vehicles ever put into production (ever heard of Suzuki X90? It’s hideous). 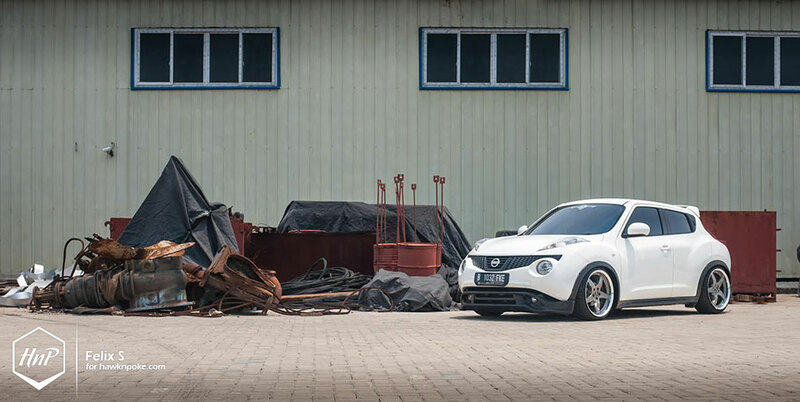 Nissan Juke, for one, has also become one of the most striking production compact cars ever to roam our streets. It’s design has been taken almost straightforwardly from Nissan’s 2009 Qazana concept. A stylish, coupe-inspired compact SUV. But, does it work? The Qazana concept was first introduced through the 2010 Geneva Motor show, and gained healthy worldwide popularity thanks to its unconventional design. Being dominated by the prominent wheel arches and body’s high waistline, which were then contrasted by slim side-windows, the car’s profile becomes similar to the “coke bottle styling” popular in the 1960s and 1970s. It also has a coupé-like legacy (from 350Z), having the rear door handles that’re hidden next to the C-pillars. Bearing a crossover genre, this adds up even further infusion into the mix. Nissan described all these beautiful mayhem as their “CUV” platform. Meet Charly, the owner of today’s beautiful-mess CUV design. 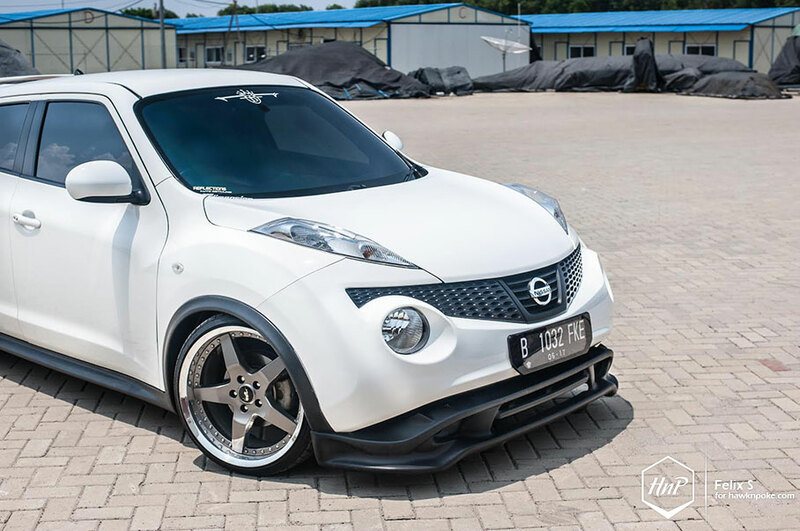 Already an interesting mix of infusions from Nissan, Charly went further by adding his favourite type of mods: aggressive fitment. 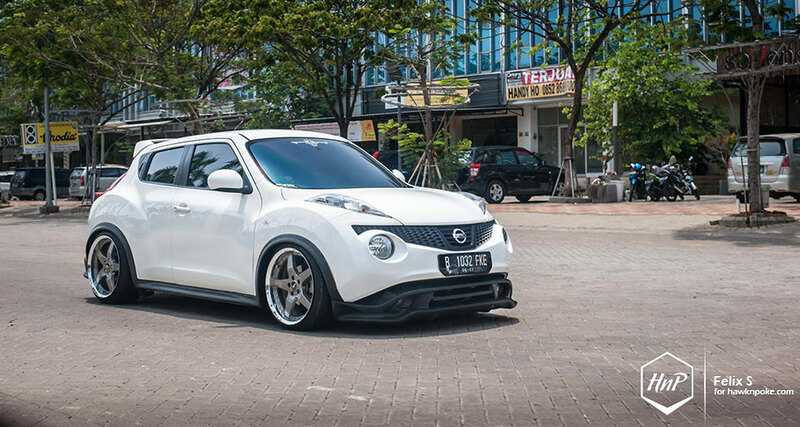 Now that’ll make this Juke as an aggressively-fitted-coupe-inspired-compact-crossover! What a lengthy title indeed. Charly completed his set of mods in an inside-out approach. He first installed an SQ-level audio setup, and went into the engine bay afterwards. 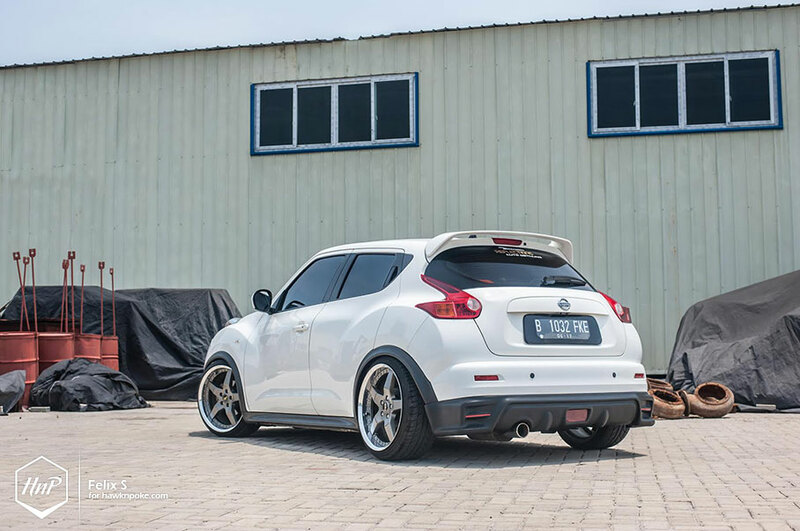 Simple bolt-on HKS intake and Kansai exhaust became his methods of choice. Upon completion of such mods, he decided to make over the exterior of the car. New shoes soon followed, which came down to this rare, Japanese 19″ 2-piece Desmond Wise wheels. 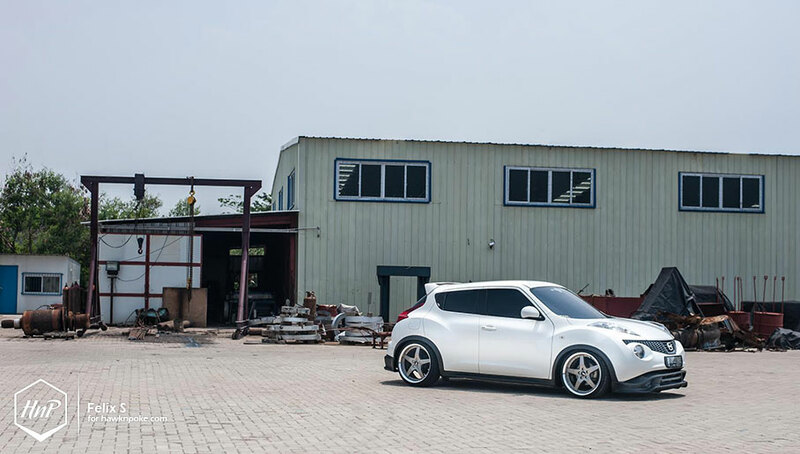 Its simple spokes and proper sizing; not too wide yet not too big, have contributed into making all these the perfect fitment for the Juke. Follow @felixsusanto for his always-awesome captures!